I have a question about crown of success products. just over doing the spell. Laying down some sachet powder for them to walk over is an excellent way to augment the magic that you are already doing on their behalf. Hey Bri I ordered crown of sucess mojo bag and dressed candle for my son and same for steady work I was going to do them but I was told if possible they should do it Is this an option for you? What exactly is condition oil? A condition oil is just another term for any of the formula oils like Crown of Success, Fast Luck, High John the Conqueror, etc. I think that you are asking which is preferable--to dress and bless a mojo bag for someone else or to have the individual dress and bless the bag themselves, is that right? If so, this is how I look at it, if you can get the person to do the work and they are comfortable doing the work and able to focus on the work and their goal in a sincere manner then by all means have them do it. But, if they think its weird or creepy or silly or whatever then they are not going to be serious in setting their intention, saying their prayers, and blessing their work, in which case its better for you to do it for them. Either way, you'll want to add personal concerns of the targeted individual to the mojo bag. was ok to add to it, thanks again. I think you are right the fact that my son is not a believer and will have no positive outcome if he comes to it with a belief that results is not gonna happen. Double strength / Triple Strength are terms most often used in connection with mojo hands, where there is leeway in terms of how many items (and what kinds of items) are placed in the hand being made. For these, a "triple strength" mojo will have more items and/or more expensive items in it than do "standard" or "double strength" hands (and likewise, a "double strength" mojo will have more and/or more expensive components than does a "standard strength" mojo). In that case I would do the work for him and ask him to wear the mojo as a favor to me, your focus and prayers will charge the bag, but you will need something of his (hair, nail clippings, saliva, etc) for the bag as well to mark it as his bag. I dont know if this question has already been addressed and I do apologize if it has but I recently graduated from college and I am in the process of applying to jobs and internships however I have not heard any thing back. I purchased the crown of success powder and I was wondering if there were any rituals I could do to help me land a job or internship considering that most of the applications are online. I know how to dress a physical application but not online ones! Is there anything I can do? Would I need to purchase any other crown of success products? Get the oil and dress your computer! And your hands, too, before you type. If you have the oil you can also dress a small 4" purple candle and have it burning near you while you apply online. Leave the oil on your hands from dressing the candle and then start typing once it has been appropriately absorbed. This may add a little "oomph" to your success. I have never used sachet powders, but I just bought two that I hope would be beneficial to my boyfriend. I don't want him to know that I'm doing this though, so that is one reason I bought the powder, no oil residue he could see. One is Crown of Success and the other is Money Drawing. I was thinking of combining the two and lightly sprinkling the inside of his shoes. Is is alright to use Crown of Success this way? Usually with crown of success I would anoint the head, so that is why I'm unsure. I was also thinking of putting a little of the crown of success powder in his shampoo (I'm out of the oil right now, so I only have the powder to work with until my next order) and sprinkling a little of the combined COS and MD powder in his wallet and on his computer and desk where he works. Using the sachet powder to dust shoes is a very traditional way to work, you can read more about it in these two pages: http://www.luckymojo.com/powders.html & http://www.luckymojo.com/foottrack.html. Dusting his wallet and computer desk (but not the actual key board where it will likely get stuck between the keys - smoking with incense might work better if you want to get the keyboard!) are also excellent ideas. For the shampoo, the oil or diluted bath crystals would work far better than the powder which will have a tendency to clump up - if you have absolutely no choice, then ensure that you take out a small amount of the liquid and completely disperse the powder prior to mixing that small amount back into the bottle. Thank you I understand working with foot tracks. I was wondering about specifically working with Crown of Success in a foot track. Would it still be as effective if not placed on the head? One of the reasons it was made into a powder was to allow for use even when crowning the head is not possible It should work just fine even in a foot track, just set your intention and call his name into it as you work. Could I use success powder and "i can,you can't powder" in an application to win in a local competition? That would be a great combination sailor5. Adding a bit of John the Conqueror or Victory sachet powder could help as well. Found a great use for this powder. Dust it in hats or other head-wear. Absolutely! This product is definitely associated with the crown of the head and the crown chakra! I actually got the idea to put some on the inside of a wig I was wearing, along with the normal dry shampoo I use to deodorize it. Lol. You would dust the application before you turn it in. This way the powders come into contact with the people handling your application. You could use the 23rd psalm with Crown Of Success. I'm currently writing a play and getting really really good feedback from readers. I'm extremely proud of it. At the same time I have runs of 3 Crown of Success candles burning for me at MISC partly for it. Once I finish it I'd like to use powder on it before sending it out to get it noticed and to get the right people interested in buying it/getting involved. Would this be the best powder to use or? Hey everyone. Good evening. What day should I employ a Crown Success vigil. I also I wanted to employ a Master Key at the same time. Can I do that on the same day or does the Master Key vigil need to be employed on a different day? Personally, I would choose Sunday or Thursday for your specific vigils. My PhD supervisor and I are looking into submitting an article for review to an academic journal. The publishing of articles in the academic field is really competitive. Hence, my thesis supervisor and I are seeking to share our article with another academic/professor to ask for a friendly review. If you are submitting a physical copy of your paper, I'd suggest dressing it with Crown of Success, Fiery Wall of Protection and Look Me Over sachet powders. If you are submitting a physical copy on a thumb drive, *lightly* dab the flash drive with those oils, as well as Fiery Wall of Protection oil. If you are submitting a copy via email or DropBox, set a physical copy of the paper on your altar, and surround it with candles dressed with those oils and pray for its success and protection. Thank you so much Sister Jean!! 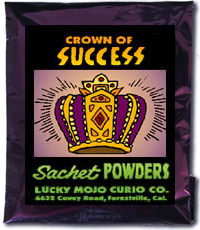 Can I sprinkle crown of success sachet powder on catalogs that I plan to pass out to people to bring in customers? I've started selling avon and plan to hand out catalogs to neighbors, family, friends..
Crown of success would be a used on you or a resume, a mojo made and carried would be great for being successful in this business as well. I would use attraction powder to draw in customers and look me over on the pages to have them look at the items. Another cool trick is to take powdered sugar and dust the book with that to make them sweet and drawn to you. Burn a yellow candle with crown of success, place a book under it as you pray to be successful in this job. I do cooking and selling food from my house to bring in extra cash every now and then. I've had a few people to buy from me but not enough to really make it worth my while to do a lot of cooking. I'm also getting ready to sell my own jars of sauce that I make, can I dust the jars with attraction and look me over powders? Yes you can dust the bottles with them, you can also add edible ingredients to the food which you pray to draw and keep attracting customers. Burn a candle with attraction oil on a petition wrote out to draw more customers. If you make a flyer for the items for sale dust them with the powder. The topic is about crown of success which is something to dress yourself with and a yellow candle on a petition to be successful.